The Board affirmed a Section 2(e)(1) refusal to register the mark CREATINE GUMMIES, finding it to be merely descriptive of "Dietary and nutritional supplements containing creatine" [GUMMIES disclaimed]. Applicant argued that the mark is incongruous and would require a multi-step reasoning process "to determine what the goods are." The Board was unimpressed. In re BPI Sports, Serial No. 87199476 (January 31, 2018) [not precedential] (Opinion by Judge Cheryl S. Goodman). Applicant BPI Sports feebly contended that CREATINE GUMMIES suggests “creative candies,” which is not descriptive of the product. It argued that multi-stage reasoning is required to determine what the goods are [That's not the test - ed.]. According to applicant, CREATINE GUMMIES creates an effect of surprise because gummies generally are candies for children and do not commonly contain creatine, which is harmful to children. And finally, BPI asserted that the applied-for mark is unique and incongruous because it is contradictory to the purpose of dietary and nutritional supplements. Examining Attorney Alicia Collins Edwards submitted eight third-party registrations for dietary and nutritional supplements or vitamin supplements with disclaimers of the term "gummies." 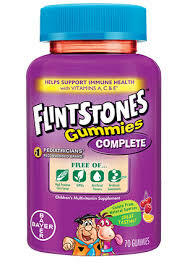 A Google brand image search for "gummies" revealed a number of vitamin and nutritional supplements in gummy form, including the one depicted above. A Wikipedia entry for "gummies" included a sub-section entitled "Vitamin Gummies." A Google search for "creatine gummies" revealed two such products. Furthermore, Internet evidence showed that creatine, an amino acid that is produced by the body, and that creatine supplements are used by body builders and competitive athletes to help increase lean muscle mass and enhance performance. The Board once again pointed out that the determination of mere descriptiveness must be made in the context of the goods; i.e., it is not a guessing game as to what the goods are. Because the goods contain creatine, the word CREATINE is merely descriptive of the goods. Moreover, producers of creatine supplements use the word "creatine" in the supplement name, a fact that also supports a descriptiveness finding. Internet articles provided by both the Examining Attorney and Applicant BPI showed that creatine may be offered as a type of dietary and nutritional supplement, further establishing the descriptiveness of the term in relation to Applicant’s goods. Finally, the Board found that the combination of the two individual terms does not evoke a new and unique commercial impression apart from their descriptive meanings. Although there was no evidence of any use of the term CREATINE GUMMIES in the marketplace by anyone else, that was not relevant. "It is well-established that where an applicant is the first and only user of a descriptive term, that does not make the term registrable." I think the real question is whether "creatine gummies" is generic. To put it to the Welch test, "please run to the store and pick up some creatine gummies." Sounds awfully generic to me. This is more like a WYHF. I can't imagine even filing for this mark in the first place.